It's wonderful to be invited by Douglas Hyland and the staff of the Museum to come here and talk to you about my father – Sanford Ballard Dole Low - because it's been an opportunity to go back through all of his files, the letters and the pictures, to present his life - a life that was dedicated to this Museum in so many different ways. I hear his voice warning me: “look it's not just about me.” That would be the first thing that he would say if he were here to make this presentation. As a young boy at this Museum, I remember so many people who helped my father. They were his extended families - his Ohana - as we say in Hawaiian, and without his Ohana he would not have been able to accomplish all that he did. I remember Flora Bentley who would always be out at the front desk welcoming people to the museum as if it were her home. I remember Harold Gray - a gentleman to the core - a very, very, very warm person. There was Lois Ice Blomstrann, Nancy Cutter, my mother of course - Jinny Low - who was here so much and who constantly supported my father. There was also Helen Vibberts, the patrons, the entire Board of Directors of this Museum, and Dr. John White - who was a Board member and the Museum's historian. I will be drawing from Dr. White's words for this talk. Also Charlie Ferguson, all of the other directors and the staff. All of these people are members of my father's Ohana . It became clearer and clearer to me - as I put this talk together - that what really allowed Sandy Low to accomplish what he did was that he was Hawaiian. He was a strange cat in ‘The Hardware Capital of the World' and so, as you will see, he was forgiven many transgressions of normal Yankee behavior. There are a number of Hawaiian concepts that I think are important to understand my father's life. One of them is Ohana , which I have already mentioned. Ohana means “extended family.” It has the sense of your core family but it's extended way, way beyond. It includes all of your friends and meaningful acquaintances. My father also had a sense of aloha – of affection - for just about everybody he met. That innate affection for people allowed him to accept so many into his Ohana , his extended family. Another important Hawaiian concept is the aumakua – the spirits of our ancestors who have gone on before us. Hawaiians believe that these spirits live on and give us the intelligence, the love and the strength to do all that we accomplish in life. My father was born in Hawaii , but spent the better part of his life here in New England . He went through many trials being away from his Hawaiian family but I know that he drew strength from his aumakua - the spiritual family that always accompanied him. And these spirits are here today. You often don't really know who your parents are - and you don't know what their contributions have been - until they are gone. I remember that the first time I really understood what my father had accomplished with this Museum was in 1967 when I came here with a friend of mine, Roger Howlett, from Yale. Roger was a graduate student working on his Ph.D. in American art. We walked through the front door together. I proceeded toward the main gallery and realized after a few paces that my friend wasn't with me anymore. I looked back. “I can't move," he said. “What do you mean you can't move”? Roger saw two paintings, one of them was this one, a Winslow Homer, Skirmish in the Wilderness , a gorgeous painting. It has a sense of danger, of combat, but also a sense that nature is going to prevail over man's frivolous actions. It's a fantastic painting that was acquired during my father's tenure. It's also rare. Winslow Homer painted very few of these Civil War paintings. Here is another - William Sidney Mount, At the Well - a very peaceful depiction of man and nature. It was at that moment that I began to realize - through the eyes of a friend - what my father had accomplished. As you know, the Museum was basically founded in 1903 with a grant from John Talcott of $25,000 for the purchase of art. By 1937, when my father began to serve on the Board of Directors, the Museum had only 24 paintings. By the time he died in 1964 there were over 1500 works of art. Going through the Museum's Highlights catalogue, I discovered 79 works of art featured as the best in our collection. Of these, 49 of them were acquired during my father's tenure. Sixty percent of the best art in this museum was acquired during his twenty-five years of service. That attests to his director's eye. I want to start by showing a few examples of the works my father was able to acquire in those twenty-five years. This is George Bellows, The Big Dory , acquired in 1944. Other examples are Robert Henri, Spanish Girl of Segovia , 1941; John Sloan, Main Street, Gloucester , 1943; Thomas Moran, The Wilds of Lake Superior , 1944; Rockwell Kent, Toilers of the Sea , 1944; William Harnett, Still life with Violin, 1942; and something totally different, Benjamin West, Thetis Bringing the Armor to Achilles , 1942. This museum was the center of my father's creative spirit for the 25 most productive years of his life. When he died an artist said of him, “He did not act like a high priest. He stirred the Museum into the life of the community.” A collector said, “My interest in American art was started and developed through Mr. Low and the Museum. He was warm and democratic with people who came in. If a person was interested in art he gave of himself unstintingly.” And in her obituary Florence Berkman wrote, “Sanford Low showed that a Museum could be not only a repository for great art but a place where the human spirit could be touched and uplifted when its guiding hand is directed by a man who felt deeply that art and life, the fundamental human values, were one, that they had no meaning apart”. I can hear his voice already; “you're laying it on a bit thick.” Yes I am Dad - but this is your day. So who was he? Dad was born on September 21, 1905 in Kohala , Hawaii . This is a picture of him taken when he was 18 or 19. You can see the Hawaiian mountains behind him and you can also see that he was a very Hawaiian looking young man. His father was known as Rawhide Ben Low - one of Hawaii 's most famous cowboys. In Hawaii you can still find some of the largest ranches in the United States and Rawhide Ben was born on one of them, the Parker Ranch. His father, John Somes Low, came to the islands from Gloucester in 1850. On his mother's side, my father's genealogy can be traced back to one of the great kings of Hawaii , King Kamehameha the First, who unified all the tribes on all the islands. My father was also related by adoption to Sanford Ballard Dole (he was named after him) who supported annexing Hawaii to the United States and served as president of the Republic of Hawaii and Territorial Governor. I think the most important thing, however, is that Sandy Low grew up surrounded by a feeling of aloha (love), in the midst of a large extended family ( ohana ), and acquired a sense of an intimate world filled with friends and relatives – a sense that he carried with him throughout his life. In 1921, Sandy Low was sent away to Loomis School in Windsor , Connecticut to gain an experience of the world beyond Hawaii : to learn something of art, history, literature and science. He had a wonderful time on the Lurline, the steamer that sailed from Hawaii to San Francisco . He formed a band that played every night in the ship's bar. He came across country by rail and arrived at Loomis School one fall day. Shortly thereafter, he wrote to his sister in Hawaii : “I arrived safely at Loomis and have come to the conclusion that this is a hell of a place. I'd have given anything to be back home again. I'm not real homesick, but I feel rotten. I miss everybody. I'd like to beat it but I guess I'll stick. I've been here one night and I nearly froze.” Not a very promising beginning for a man who was to spend the rest of his life in New England . 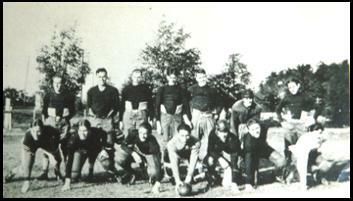 He played on the school's varsity football team – halfback – in his bare feet. He stayed at Loomis for 3 months - until the snow flew. Then, with homesickness so strong he couldn't stand it anymore - he ran away. He took a freight train (he jumped on one) and went to visit relatives in Long Island . He had a dream of being “a cartoonist.” He wanted to draw sketches, do caricatures. So, having abandoned highschool in his freshman year, he found himself at the Museum School in Boston , one of the finest art schools in the United States . He was to spend four years there. In 1927 Sandy graduated from the Museum School . He went on to New York City where he rented a loft at 21 West 35 th Street . While in New York he studied at the Grand Central School of Art and the Art Student League. He spent four years there as a commercial artist. This is a painting of my father - probably by one of his art school colleagues. Clorinda Lucas, his sister, showed up one day at his New York studio and found a Stutz Bearcat – an expensive automobile - parked outside. She said, “ Sandy , whose car is that?” He said, “Oh, it's mine.” That was, of course, untrue. He had been loaned the car by a wealthy admirer - an attractive young woman, I assume. During his New York period, Sandy Low became somewhat of a celebrity out on Long Island where he would be invited to a variety of parties. In those days, you may remember, Gar Wood speedboats were the sleekest and fastest of all - beautiful, slim, powerful boats with a sloped-back windshield. The swains of the day would aquaplane behind such boats to show their prowess. An aquaplane was a board, about six feet long and three wide, which was towed behind the boat at high speed. Just being able to stand up on one of these careening boards was considered the height of masculine showmanship. But dad had been a surfer, a canoe paddler, and a beach boy. He had spent most of his life in the water. So he took aquaplaning one step farther. He stood on his head. Now it is 1930. Sandy Low has been a commercial artist for four years in New York City . After his marriage, he moved to New Britain , Connecticut – “The Hardware Capital of the World.” What is he going to do here? One of the first things he did was to organize an exhibit his paintings. In January 1930, a few weeks before his marriage, he presented “twenty-two oils, many drawings and imaginative color sketches” at the New Britain Institute. He was invited to exhibit by the famous Fanny Brown who had charge of collections and programs at the New Britain Library – the original home of the Institute. The article goes on: “A humble old red barn will soon become the home of New Britain 's first art school. Gone is the quiet that for years has haunted the old building as it stood, silent and ignored, at 30 Cedar Street . Today it echoes the sounds of busy workmen who are reconditioning it for the new and important role it is to play in the city's life. Within it's walls strange changes are taking place. Familiar stalls and stables are being torn away. Partitions are being removed. Rats and mice and cats, tenants of yesterday, have fled in terror before all this confusion. A big studio is being fashioned – a studio in which many future artists of New Britain will receive their first training.” This new institution was known as The Art League of New Britain or, more simply, The Studio. Supporters of The Art League included Arthur Kimball, Judge Hungerford, William F. Brooks, Mrs. Stanley Hart, Miss Fanny Brown, Wesley Parker, Lawrence Edwardson, Miss Minna Richter, and Earle K. Bishop. Also Grace Vibberts and Margaret Cooper who donated paintings which were raffled off to raise seven hundred dollars for the art school. My father brought in Thomas Craven and William Zorach to lecture and Spencer Nichols and Herbert Meyer to teach art. Sandy Low and his colleague, Walter Korder, painted dozens of murals at the Art League, beginning in 1937 with a series he called “The Connecticut Murals.” Among them, Walter and Sandy painted a 30-foot piece that was displayed at the New Britain Savings and Loan Association in 1957. As I understand it, the artists charged $5 a square foot. The murals were put up in restaurants, hotels and office buildings. The Studio transformed the social life of New Britain by bringing together in moments of camaraderie, probably for the first time, artists and people from all walks of life - businessmen, storeowners, lawyers, doctors - all kinds of folks that would normally not have anything to do with artists. The Studio's motto, meticulously painted, presumably by my father, hung prominently over a workbench that also served as an impromptu bar during parties. It read: “welcome all both great and small.” And that's how it was. Among those ‘plots and notions' were parties that drew people from far and wide. There were costume parties, ‘casino nights' and even ‘Hawaiian nights' featuring hula dancers – my father's relatives. Word about The Studio spread as far as the Hawaiian Islands and Hawaiian relatives would show up on my parents' doorstep. When Hawaiians come to visit, they don't stay for a day or two, they stay for weeks. Dad and Mom were always glad to have them. Steven Dohanos, an illustrator for the Saturday Evening Post, was one of Dad's great friends. This is one of Steve's illustrations for The Post. It depicts The Studio and the kind of life that Sanford Low was able to bring to a once decrepit barn. Here he created a new Ohana – a family of business people, professionals and artists - bringing them all together to weave art into the life of New Britain . Between his arrival in 1930 and 1939, when Sandy Low was nominated to the Board of the New Britain Institute, he was very busy in the local and not-so-local art world. He was co-founder of the Connecticut Watercolor Society and its President for nine years. He was also President of the Association of Connecticut Artists, an elected member of the Salmagundi Club - the oldest art club in the United States – a member of the American Watercolor Society, the New York Watercolor Club and President of the Connecticut Academy of Fine Arts. One of his paintings was selected to represent Connecticut in the 1939 World's Fair. The Museum had moved in 1937 to the Landers House. There were only 24 paintings in the collection so there were many empty walls. Having been elected to the Board, one of the first things Sandy thought he should do is go to New York to become acquainted, or perhaps reacquainted, with the directors of other art museums and with art dealers. “My first consideration”, he wrote in a memo to the museum directors, “was to establish relations with those important museums whose art resources could be made available to us in the way of loans”. He visited the Museum of Modern Art , the Whitney, the Milch and Frank Rehn Galleries and eleven other dealers. He also went to New York with a very well thought-out business plan. At that time there were three ratings that a museum might be given by insurance companies - A, B or C. The New Britain Museum had a B rating, which meant it could only receive loans of paintings up to $2000 in value. When he went to New York , Sandy knew that he had to change that. He visited the Whitney Museum - armed with photographs, drawings and statistics - and convinced them to give the Museum an A rating. That meant that the museum could receive loans of paintings from all over the United States and that's exactly what happened. On that trip, he accomplished two things: to extend the o hana of the Museum to include the great galleries, collectors and dealers in New York and to solve an insurance problem that would allow that ohana to loan paintings of great value to the Museum. He closed his memo to the Board in a typical Sandy Low fashion. He wrote: “Off the record, the weather was frightfully hot, the air-conditioned bars a great relief, and all in all, a trip for which I am truly grateful”. There was another side to Dad. He loved practical jokes. Bob Vose and his family were perhaps the most dignified personages you could imagine. They were beyond reproach. Bob's father – Bob Senior - never drank, nor smoked nor swore and wore a coat and tie every moment of the day that he was out of the house. My father, knowing Mr. Vose's tendency to be a little stiff, and wanting to tweak his son, Bob Junior, sent the senior Vose a telegram: “Dear Mr. Vose, your son's name is associated with our Museum in the public mind. His recent carousing in our local nightspots is an embarrassment for this Museum. We are hoping you can curb these excesses.” My father signed the letter formally – “Sanford Ballard Dole Low, Director, New Britain Museum of American Art.” The senior Vose was obviously irate with his son, thinking that he had disgraced the gallery, and it took a bit of time for Junior to convince Senior that it was all a practical joke – that this Hawaiian guy was a little different than normal museum directors. The New Britain Museum eventually acquired 75 paintings with the help of Bob Vose who always steered good art to our Museum. For example, Albert Bierstadt's Seal Rock was purchased in 1962 for $5000. Its value today, according to Bob's son - Terry Vose - is $3,000,000. Of the acquisition of Seal Rock , Bob Vose wrote: “an illustration of Sandy 's ability to immediately recognize an important painting came in October, 1962. We had purchased Bierstadt's Seal Rock , which my father had sold early in the century for $250. I took it to a breakfast meeting to a friend in Southport but he didn't like it. I stopped to see Sandy on the way home and he walked out to the car with me to say good-by. The Bierstadt was face down in the back of my station wagon. Sandy asked to see it and the rest is history. It is one of the most admired in the New Britain collection”. Here also is Asher B. Durand's Sunday Morning. Purchased in 1963 for $7500 - it is the only painting bought from Vose for over $5000. Durand's son thought that it was one of his father's finest paintings. Here is Thomas Cole's The Clove, Catskills. In 1912 it sold for $70. It was sold to our Museum in 1945 through the Vose Galleries for $1000. It was reproduced in color by the Metropolitan Museum in the Hudson River School Catalogue and described as “possibly the masterpiece of Cole's early career”. It was shown also at the National Gallery. The Catalogue for that show said that “with this painting Cole has taken his place in a single leap among the great masters of landscape”. The value of this painting today is $4,000,000. This is Frederic Church's Haying in New Haven , also known as West Rock, New Haven , a painting that was included in the Hudson River School exhibit at the Met and the “Church Show” at the National Gallery. Of this painting, our catalogue says, ““with its beautifully detailed depiction of nature, its lessons about past and present, and its strong personal association for the painter, West Rock, New Haven stands as one of Church's most appealing creations. It was his first masterpiece, one of those key works in an artist's career that not only summarizes all that has gone on before but also announces new interests and predicts new artistic directions.” This painting was sold by Vose to us for $1000 and is today valued at $4,000,000. The dramatic increase in value is an example of what has happened to American art in general but it also shows that Sandy Low had a good eye and that the aloha shared by Vose and Dad produced some amazing results. One of the single most important events in the history of the Museum was the enlisting of Alix W. Stanley as one of the patrons of this great institution. This ‘enlistment' was accomplished by the partners - Vose and Low. About that seminal event my father wrote in an undated memo, “In 1939 the massing of war clouds in Europe forced the return to New Britain one of her native sons, Alix W. Stanley, a retired wealthy industrialist, who had lived for 15 years on his estate in Southern France . Although previously never interested in art he took it up on his return to this country for want of something to do. As is his custom, anything he does is done completely, sparing no effort or persons. During 1940 it was my good fortune to have a hand in stimulating him into the possibility of buying pictures as a hobby .” What an understatement! But said with proper humility and with a sense of aloha for Alix Stanley, one of the great personages of New Britain . Bob Vose loves to tell the story of Mr. Stanley's introduction to the art world. It begins when Bob went on a trip throughout much of Connecticut with 7 paintings in his station wagon. It was Christmas Eve, 1941. At the end of the trip, not having sold even a single painting, Bob came to visit my father - probably at The Studio. Bob told Sandy his story of woe. My father then got a bright idea. He said, “there is a gentleman up on the hill, Alix W. Stanley, a member of the famous Stanley family – the founders of Stanley Works. I've always wanted to get him involved somehow in the Museum. He doesn't like art but he ought to. Let's go visit”. Bob was naturally concerned about calling without a proper introduction, but Sandy was undaunted. They got into Bob's station wagon, drove to Mr. Stanley's house and knocked on the door. As they were waiting for it to open, my father turned to Bob and said, “The old gentleman is a teetotaler. The first thing we're going to do is ask for a drink”. Mr. Stanley's butler opened the door and Bob and my father slipped inside the Stanley castle for the first time. Eventually, Mr. Stanley came out. Dad introduced Bob Vose as “an expert in American art from the world's most famous American Art gallery.” Before Mr. Stanley could say anything, Dad said “and he needs a drink”. Some moments of confusion followed. There was no booze in the house. Finally, out comes the cook with glasses of cooking sherry - which served the purpose just fine. Eventually, the paintings were brought in and arranged around Mr. Stanley's large parlor - against the wall. My Dad and Bob Vose talked about each painting. At the end Mr. Stanley said, “Well, I don't know anything about paintings, but I thank you very much”. “You should buy them all,” my father answered. Well he didn't buy them all but he did buy three. One of them is possibly this one - a Hibbard entitled West River Valley Vermont . According to Bob Vose, Mr. Stanley bought a Hibbard, a Vining, and a Waugh. We have one Hibbard in our collection and we can presume it is a gift from Alix W. Stanley. As a result of this first modest purchase of three paintings, Mr. Alix W. Stanley became extremely interested in art. He became an astute collector and he went with my father to New York on many occasions to buy art. He eventually gave a great deal of money to this Museum, including his art collection. Even more importantly, his life took on entirely new depths of meaning. In the end, hebecame an amateur painter himself. I don't know who else but my father could have accomplished this. I think that Mr. Stanley could feel the aloha that emanated from my father - his sense of joy – and he decided to see what this Hawaiian guy had to offer. I think one of Dad's innate abilities was to involve people in his enthusiasm. But where did he get the chutzpah to so aggressively intrude on Mr. Stanley's privacy? I think that it was important to my father that he was on a mission. I don't think he ever put himself personally forward. I think he did so only when there was a larger purpose - and that larger purpose was to help his friend, Bob Vose, and to bring to the Museum a great new benefactor. Martha's Vineyard Island was one of Dad's favorite places in New England . He discovered there a way of life that reminded him of his beloved Hawaiian Islands . He fished, he enjoyed the ocean. He gathered together a group of artists, shown in this photograph. Steven Dohanos(third from left) is a well-known illustrator and a benefactor of this Museum. The pugnacious, tough-looking gentleman (fourth from right) is Jim Cagney – the actor. Jim painted as well acted. He lived on Martha's Vineyard in the summer, and somehow my father and he got together and Cagney became a member of the Vineyard artist's group. 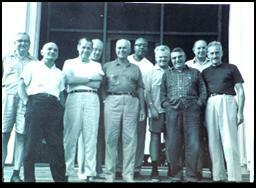 Here is Louis Fusari (second from left), an art teacher and a fine restorer of paintings; Irving Katzenstein (last on right), artist; Walter Korder, Dad's partner in mural painting (third from right); and also Mr. Ned Allen (second from right), amateur artist and owner of the fine Hartford department store – Sage Allen. It was a group of people “both great and small.” Welcome all! In their forty or so years of visual explorations, the Vineyard artists came back with scenes of beaches, boats, houses, lobster pots, gulls, fishermen... They painted in all kinds of weather. At the end of their stay, they displayed their work on the porch of our gingerbread house in Harthaven, on the Vineyard. Most everyone in Harthaven came to drink gin and tonics and old-fashioneds and admire the paintings. Here are a few examples of my father's paintings. He began working in oils, and then became a well known watercolorist. He experimented with acrylics and even with wood sculpture. The Vineyard connection led to what I suppose to be one of the most amazing acquisitions of a work of art by a small museum – or maybe even a large one - the story of the Benton Murals which were acquired from the famous Whitney Museum in New York . I am going to begin with the words of Avis Berman from a 1992 article in the Magazine of the Hartford Courant . To get the murals out of the Whitney, my Dad had to take out a skylight, hire a crane, and go there personally. This is how Avis describes the caper: “ New York City , December 1953,” she wrote. “Five or six men are loading a crate parked at 10 West 8 th Street in the heart of Greenwich Village . Four large, heavy, murals, canvas on masonite panels, crossed in the back with 2 x 4's and 2 x 6's, are being hoisted through the skylight of a nearby building and lowered to the street. Grunting and sweating the men finally get all the panels into their truck. Their leader, Sanford Low, inspects the job, gives his okay and climbs into the cab. The vehicle heads north as quickly as possible as if the driver fears that the occupants of the building would claim the cargo if they had time”. And indeed, as it turns out, well they might have. Tom Benton was one of the “regionalist” artists, as you all know. He painted life in America as he saw it. He traveled through our country. He went on canoes, he went on horses, hung out in bars, did what he had to do to put his finger on the pulse of this great nation. He had an amazing, deep, abiding feeling for this country. He pictured life in the raw - dance halls and cowboys, business tycoons and poverty stricken farmers. For a time, he was considered one of our great artists. But he had fallen into disfavor by 1953 when Alix W. Stanley got wind of the possible sale of his murals by the Whitney Museum and told my father about it. The possible acquisition of Benton 's murals fit perfectly my father's strategy for buying. Benton was, as my father wrote, “one of the truly great American artists of this century”. My Dad wanted to acquire good examples of regionalist painting and, because they were out of style at the time, he knew such paintings could be had for bargain prices. He also felt that the murals would appeal to the people of New Britain . “We are in an industrial and farming area,” Dad wrote, “so that I figure they (the murals) will be appreciated and liked by everyone”. The way that these murals came here was due in part to “the Martha's Vineyard connection” and in part to my father's love of food - a zest for all kinds of cuisine. Dad acquired this taste, I think, from his Hawaiian background. I remember him collecting sea urchins on the beach and eating them raw. When he did this on Martha's Vineyard for the first time it caused immense consternation. His love of food brought my father together with Denys Wortman, a well-known syndicated cartoonist who was also a great cook. Together they cooked turtle soup – which was a failure – and put on a traditional Hawaiian Luau – which was a great success. It was through Denys that my Dad met Tom Benton. At the time, Tom was painting a portrait of Wortman and Wortman, while he was sitting for the portrait, was painting a portrait of Tom. One summer day, Denys invited my father to visit Benton in his studio. Benton and my father hit it off immediately and in the later years of their friendship, Benton would often visit our home on the Vineyard and in Southington , Connecticut . It was obvious to me, even as a boy of eleven or twelve, that the two men loved to be in each other's company – cooking great feasts, imbibing cocktails, talking art and telling stories. Sure enough, as my father and the directors of the Museum and everybody associated with this acquisition had predicted, the pendulum of artistic taste began to swing in Benton 's direction. In 1989 there was an 85 painting retrospective of Benton 's work which opened in Kansas City and went on to museums in Detroit , New York and Los Angeles . The centerpiece of the show was the Arts of Life murals. An additional irony was that the Whitney, the Museum, which had deaccessioned the murals 36 years earlier, hosted the show in New York . But this time the paintings were on loan to them - from the New Britain Museum of American Art. Here is the portrait that Benton did of Wortman (left). And this is the portrait that Wortman did of Benton (right). These two paintings are here in this museum as well and they are actually what my father was after when he visited Benton in 1952. He had no idea then that he was going to acquire the wonderful murals as well. Nor could he have predicted in 1941, when he first visited Alix W. Stanley, that Mr. Stanley would play such an important role in discovering the murals in the first place. Tom Benton and my father became great friends. This photograph was probably taken in Dad's office at the Museum in 1953. It shows the two of them in a characteristic moment - drinks in hand, laughing together. “Your father is the damndest Museum director I've ever known,” Benton once said to me. “For one thing, he's an artist himself, he's also a person who knows about art and art history, he's got a good eye, and he likes bourbon almost as much as I do”. The last thing I want to imply in this small talk is that my father was a successful museum director purely because he was, as Tom Benton said of him, “a good red blooded American” – albeit a Hawaiian-American. The power of his personality was formidable, to be sure, inspiring Judith Brown to write of him in her loving remembrance after he died that “to be sitting in the company of Sanford Low even for a few hours was like sitting before a glowing fireplace on a chilly evening.” But my father also had a formidable eye for the best in art and a keen mind which he schooled himself – much as Tom Benton did – by reading avidly, and studying, and being a good listener. Here is John Stuart Curry's The Black Stallion , a gift to the Museum from Steve Dohanos, one ofmy father's great friends. Here is Norman Rockwell's Weighing In . Judy Brown says that this painting was a personal gift of the artist. According to her recollection, Norman Rockwell appeared at the Museum with this piece of work under his arm, wrapped up in plain, brown paper. Dad wasn't there so he simply left it for him. Here is N.C. Wyeth, my mother's favorite illustration in our collection. It's a great example, “ One More Step Mr. Hands” . This is Charles Burchfield's Lavender and Old Lace. This is a painting my father often pointed out to e. As a young boy I was not terribly interested in art, but this one did capture my attention. I'm sure he knew it would. Anybody can be moved by this painting. I've never forgotten it. Here is John Haberle's Time and Eternity . Bob Vose mentions that Sandy and John were good friends and that Dad took Mr. Vose many times to John's studio in New Haven . Here are two more wonderful works acquired by my father for the museum - Maurice Prendergast's Beechmont - and this one, Andy Wyeth's, McVey's Barn . As you all know, Dad was present in 1964 when the Philip Bartholomew Stanley Memorial Wing was opened to house Tom Benton's murals and lithographs and he died two days later. I would like to read, if I can, a poem by Kay Schauffler who was one of Dad's great friends. I think it sums up all that I have been trying to say of my father. It unconsciously embodies his Hawaiian reverence for the aumakua - the ancestors; his warm sense of the o hana - the extended family; and my father's feeling of aloha - the spirit of love that infused his life. I'm not sure I can do this. I've tried it, rehearsed it. We'll see. he made them in some SPECIAL way his own. the thud of apples from a windy tree. outside his window by the banquet apple tree. with tender misty green had just begun. our own Atlantic and colder northern shore. a strong unbroken and coherent whole. somehow rubbed off on us who knew him well. more vital and more friendly and more kind. our love goes with you and our gratitude. I think that says it all and I'll stop here. That poem is a gift of love to my father from one of his great friends. And this museum was my father's gift of love to all of us.